Mobilize Labor's Power Against Racist Police Repression! Workers and Students, Shut the City Down! OCTOBER 26 – Yesterday morning, October 25, Oakland police along with cops from 16 other jurisdictions evicted Occupy Oakland from the Oscar Grant Plaza in front of City Hall, and another satellite camp in a park a few blocks away. There were close to 100 arrests. Later on Tuesday, a demonstration protesting this attack swelled from 500 to some 3,000, marching all over the city of Oakland. The protest was repeatedly attacked by the police, who clubbed demonstrators, fired tear gas on at least four different occasions, as well as concussion grenades, bean bag canisters and wooden slugs and possibly rubber bullets. Protester Scott Olsen was taken by fellow demonstrators to the hospital after being hit in the head by canister fired by police in Oakland on evening of October 25. 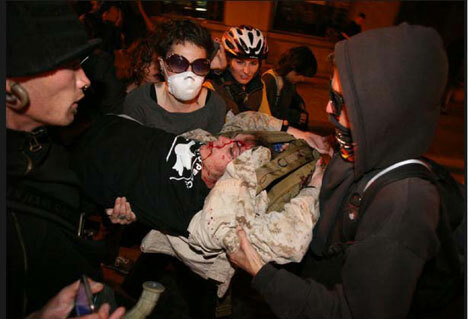 One of the protesters, Scott Olsen from Wisconsin, an Iraq war veteran and member of Iraq Veterans Against the War, was hit in the head by a canister during the protests yesterday. He was initially reported earlier this afternoon to be in serious but stable condition. Now the London Guardian is reporting that the hospital says he is in critical condition with swelling of the brain. In addition, a comrade reports from downtown Oakland this afternoon that people are saying a second demonstrator who was hit in the back by a bean bag projectile yesterday is paralyzed. It is urgent that the workers movement mobilize its power now against this rampant police brutality, and not just in press conferences and after the fact demos weeks or months later. 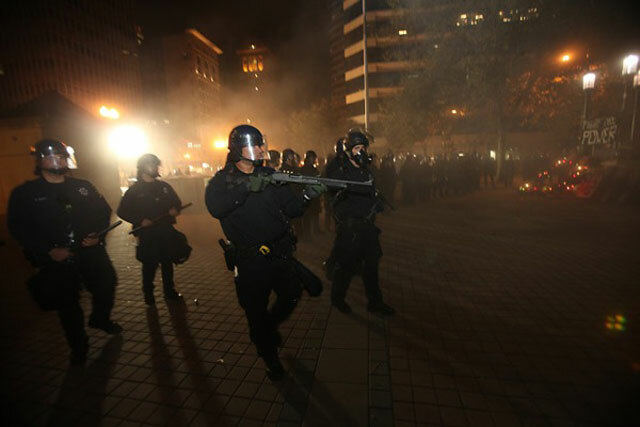 The Oakland police are the same force that attacked an antiwar demonstration at the Port of Oakland on April 7, 2003, firing the same sort of potentially lethal munitions and injuring at least six longshoremen. This is also the city where Oscar Grant was murdered by BART police on New Year’s Day 2009, and where hundreds were subsequently arrested by Oakland cops in protests against that racist lynching. Internationalist Group at Occupy Wall Street solidarity march against police repression in Oakland, October 26. These statements and calls must be translated into concrete action, in the form of a union presence at the protest site and a vow by labor to shut the SF Bay Area down in the case of an attempted eviction. 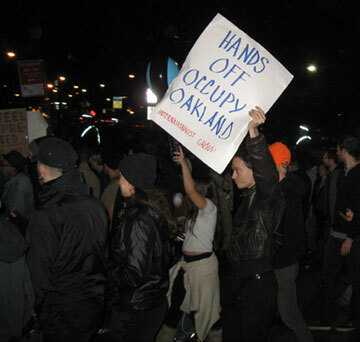 The workers movement in the Bay Area, with the powerful International Longshore and Warehouse Union in the lead, should use its muscle to enable Occupy Oakland to reestablish its prominent presence. Labor must not allow voices of protest to be silenced. The ILWU motto “An injury to one is an injury to all” is as urgent today as it was when the syndicalist “Wobblies” first raised it over a century ago. In New York City, the fact that several thousand union members and supporters came out at 6 a.m. on October 15 was key in preventing an eviction here. While criticizing the predominantly bourgeois populist/liberal politics fostered by the initiators of Occupy Wall Street, the Internationalist Group has participated in marches and actions to defend OWS against police attack as well as participating in debate at the plaza calling for working-class mobilization against capitalism.